The chopper craze began in the US after World War II. Returning soldiers looked at current offerings from Harley-Davidson and Indian and thought them unwieldy compared to the smaller and lighter European motorcycles they had experienced during the war. So they began to chop unnecessary parts from the bikes: windshields, large headlights, crash bars, etc. As the chopper was more about looks than function the handlebars were raised (‘ape hangers’) and the riding position was laid back. It was all in pursuit of a cool look. The culmination of the chopper was the 1969 movie Easy Rider, and this prompted Norton to create the Hi-Rider out of the Norton Commando. Although very much an evolution of the existing Atlas parallel-twin, Norton was onto a winner when it released the 750 Commando in 1968. The pushrod twin with separate four-speed gearbox had its origins back in the 500cc Dominator, but the Commando incorporated a unique Isolastic system. The engine, gearbox and swingarm were assembled as a single unit with front and rear engine plates, and then mounted in the single backbone frame with isolating rubbers. So, while the 360-degree long-stroke twin (73mm x 89mm) was always going to vibrate excessively, the rubber Isolastics cleverly insulated this vibration from the rider. As the swingarm was also rubber mounted in relation to the steering head, this should have led to uncertain handling, but it didn’t. A well-set-up Commando was one of the best-handling machines on the road, and the attractive and torquey twin was a joy to ride. It was no surprise the Commando was a hit. But despite winning five consecutive British MCN ‘Machine of the Year’ awards, Norton’s future was bleak. Honda’s four-cylinder CB750 had already blitzed the US market and the other Japanese manufacturers threatened to continue this state of affairs with a deluge of new, large-displacement machines. 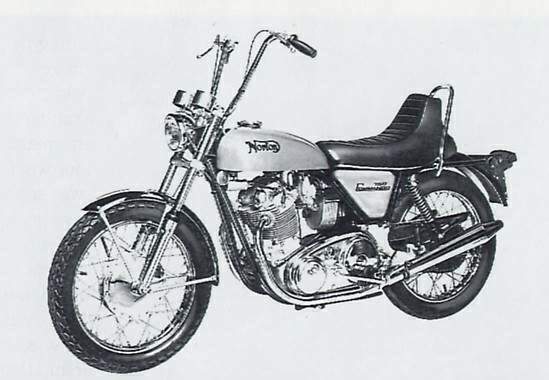 Norton needed to boost US sales and for 1971 it created the Hi-Rider, a cosmetic adaptation of the regular Commando designed to appeal to the chopper crowd. Setting the Hi-Rider apart was a tiny nine-litre fibreglass fuel tank (also shared with the SS Commando), excessively raised but unbraced handlebars, and a strange dual seat and handrail. The high rear seat hump made two-up riding virtually impossible and the small tank virtually ensured trips were limited from one drive-in restaurant to another. Real choppers generally had a raked-out front fork; Norton considered extended fork tubes but didn’t adopt those fearing problems with production motorcycle regulations. Another concession to style was the fitting of a small (146mm) headlight. 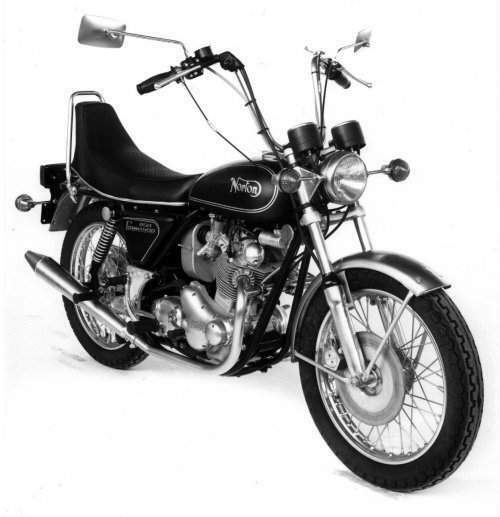 The Hi-Rider was the second-most-expensive Commando (after the Production Racer) and sold well enough to make it into the 1972 line-up. However, 1972 was a year to forget for Norton. Although the new Mk IV boasted extensive engine updates, this was the year of the notorious Combat. The self-destructing, high-compression Combat engine didn’t make it into the Hi-Rider, but the Commando’s reputation suffered. Fortunately, Norton made amends with the Mk V 750 of 1973, Now with the 32mm carbs of the Combat but without the high-compression pistons, this final 750 Hi-Rider was more reliable and produced a comfortable 60hp (44kW) at 6800rpm. Options now included a front disc brake instead of the weak drum (although it still wasn’t the greatest), and turn signals. The Hi-Rider continued to sell reasonably well – at least well enough so that when the Commando grew to an 850 during 1973, so too did the Hi-Rider. And despite its bizarre looks, the Hi-Rider was one of Norton’s most enduring models, lasting until the 850 Hi-Rider II of early 1975. So where does that leave the Hi-Rider today? It was weird when it was new -- Cycle magazine described its looks as “hilarious” in 1974 -- and it looks even stranger nearly 40 years on. Functionally and aesthetically flawed, the appeal of the Hi-Rider lies in what it represents: the first factory-built, volume-production custom bike.